If you are in Japan or are planning to visit Japan and would like to know more about our University, you are welcome to visit our campus. You can see what the lives of Nagoya University’s students are like and also talk to our admission officers if you have any concerns regarding the admission process. To help us in arranging your visit, please fill out the form here. From Nagoya Stn. (名古屋駅から): Take the Subway Higashiyama(東山) Line to Motoyama(本山) Stn. (15 minutes), then transfer to the Subway Meijo(名城) Line to Nagoya Daigaku(名古屋大学) Stn. (Higashiyama Campus is just off the subway exit). From Centrair (Central Japan International Airport)(中部国際空港から): Take the Meitetsu(名鉄) Line to Kanayama(金山) Stn. (30 min. 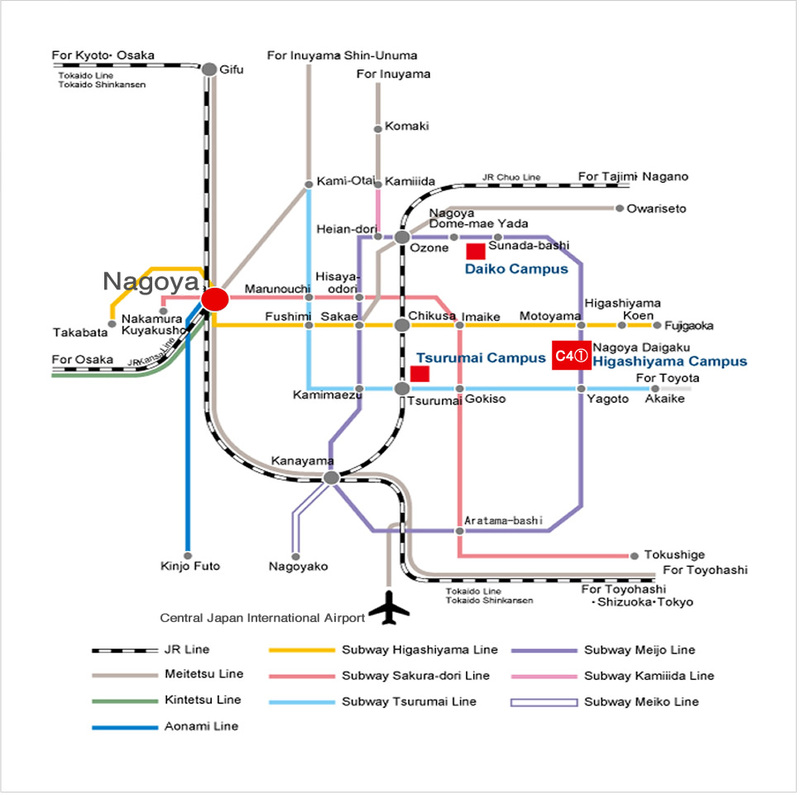 ), then transfer to the Subway Meijyo (Purple Line) to Nagoya Daigaku(名古屋大学) Stn . (21 min). Note: It is advised to come by public transportation. The parking space within Campus area is not free and the number is very limited. From Centrair (Central Japan International Airport)(中部国際空港から): : Take the Meitetsu(名鉄) Line (30 min) or the airport bus (60 min). From Tokyo Station(東京駅から): Take the Shinkansen (103 min.). From Shin-Osaka Station(新大阪駅から): Take the Shinkansen (52 min. ).